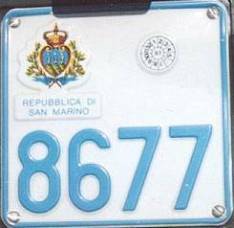 Plates of motorbikes from San Marino have always been square, with a serial number of 4 digits, with leading zeros if needed. Anyway they changed their look in the past a couple of times. The first kind of motorbike plate is shown in the first picture and was used from 1966(?) 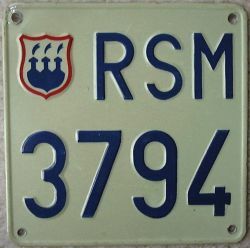 until 1979: as you can see, the coat of the arms and the letters RSM are on the first line, while the 4 digits of the number are on the second. 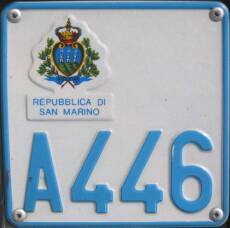 In 1979, as for cars, a new coat of the arms made with polychromatic techniques and the full print "Repubblica di San Marino" were introduced on the plates of motorbikes, as you can see in the second picture. You can also notice a validation sticker on the left: nowadays stickers are not used any more. 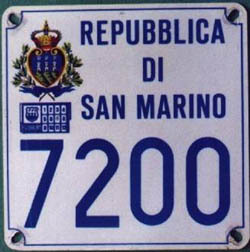 Since 1987 motorbike plates have had a bigger coat of the arms on the top left corner, whit a small "Repubblica di San Marino" printed below, as you can see in the last picture. At the beginning they had a round validation sticker in the top right corner, but in 1993 it was removed and on April the 13th, 1994 a letter was introduced in place of the first digit, exactly like in the plates of cars, even if it was not needed because the last issued number was 9099 (many thanks to Olav Arne Brekke for this detail), and the numbering restarted from A001. I need to thank Alessandro Libanore for the second picture, Martin van der Valk for the third and Karsten Kuhn for the pictur number 4. The first picture is taken from the web site of FrancoPlaque.